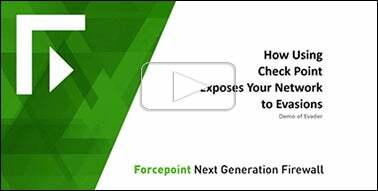 Industry tests reveal that many of the leading next generation firewalls (NGFW) are vulnerable to evasions. Evasions take advantage of design flaws in many firewalls and allow exploits and malware (including aggressive ransomware attacks like WannaCry) into your network undetected. Note: Evader is not a hacking tool or a penetration test intended to transmit arbitrary exploits. It is offered solely for testing and should not be used against any systems outside your environment. Using AETs, Evader tests whether or not a known exploit can be delivered through security devices you specify to a target host. Forcepoint’s network security group literally wrote the book on evasions, which manipulate the underlying transport of information over the network to get traffic through inspection systems and into your network. More and more, they’re being used in cyberattacks to carry exploits and malware that otherwise might have been caught by conventional networking devices. For example, one type of evasion splits malware into pieces that are transmitted out of order. Defenses that aren’t designed to protect against evasions don’t see the malware and let the mixed up traffic through. Once inside your network, the malicious code gets reassembled and can attack your servers, databases, and users.